The Book of Mormon printer’s manuscript has been published virtually in its entirety, but what LDS historians consider the “crown jewel” of the book’s origin — the original manuscript handwritten as Joseph Smith dictated to scribes his translation of the Nephite record preserved on gold plates — exists only in fragmentary form. Now, the history department of The Church of Jesus Christ of Latter-day Saints has announced the acquisition within the past two months of yet more fragments from that priceless document. These will be combined with the approximately 28 percent of the manuscript in the department’s possession for publication within the next three or four years as part of the Joseph Smith Papers project, according to department officials. Photographic images of the existing pages or fragments will be published in the forthcoming volume with a typescript copy of the content of each page presented on the facing page in the book. 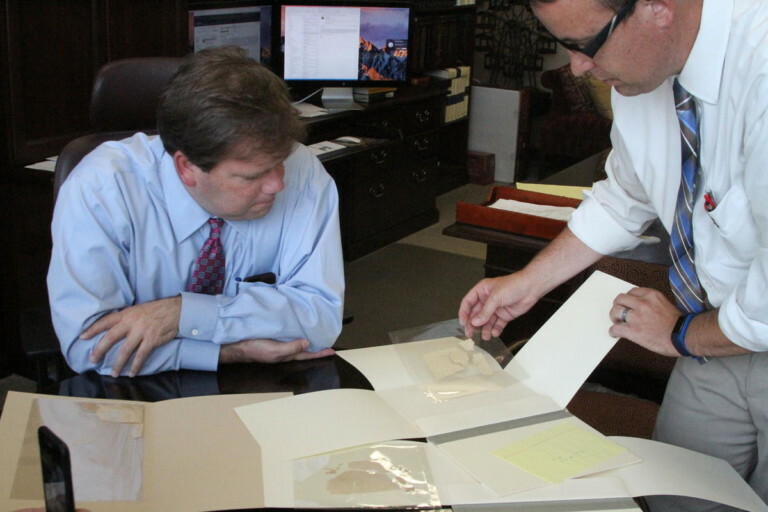 Reid L. Neilson, Assistant Church Historian and Recorder, and Robin Scott Jensen, associate managing historian and project archivist for the Joseph Smith Papers project, displayed the newly acquired fragments Wednesday in a meeting with a Church News and a Deseret Newsreporter at the Church History Library in Salt Lake City.